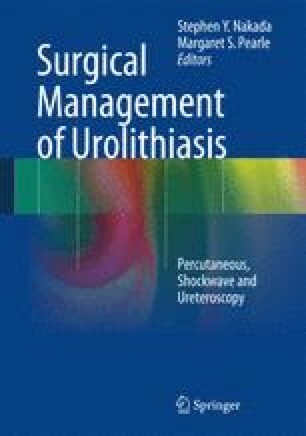 Since the initial description of “percutaneous pyelolithotomy” by Fernstrom and Johansson in 1976, percutaneous nephrolithotomy (PCNL) has become the standard for the treatment of large renal or proximal ureteral stones [Fernström and Johansson (Scand J Urol Nephrol 10(3):257–259, 1976)]. Recently, various versions of the procedure have expanded indications to treat a variety of stone burdens and have rendered open nephrolithotomy as a historic procedure. With shorter procedure times, lower transfusion rates, lower narcotic requirements, shorter hospital stay, faster convalescence, and lower cost, PCNL can be applied to nearly any stone burden or location [Snyder and Smith (J Urol 136(2):351–354, 1986)]. Despite overall safety and effectiveness of PCNL for the therapy of renal stones [Preminger et al. (J Urol 173(6):1991–2000, 2005)], PCNL can still be associated with significant morbidity, especially when complications are monitored in a standardized fashion. One recent study cited a nearly 60 % complication rate [de la Rosette et al. (J Urol 180(6):2489–2493, 2008)]. While the majority of these complications are mild, the urologist must be ready to prevent, appropriately identify, and treat any complication that he/she could encounter during or after PCNL. The focus of this chapter is to provide the reader with an appreciation for the complications associated with PCNL. A review of recent literature pertaining to the prevention, early identification, and proper management of issues that may arise during or after PCNL will be discussed followed by a case presentation used to highlight lessons learned during this summary.